A $45 million replacement satellite for the Global Positioning System constellation was lobed into space on Friday by a Boeing Delta 2 rocket following a midday blastoff from Cape Canaveral. Running a day late after technicians had to re-install a wire inside the rocket, the Delta 2 was launched at lunchtime from pad 17A to begin a 25-minute trek to deliver the Lockheed Martin-built GPS 2R-6 spacecraft into an initial orbit around the Earth for the U.S. Air Force. With the release of nearly 700,000 pounds of the thrust, the rocket vaulted from its oceanfront launch complex at 12:14:02.219 p.m. EST and quickly dissappeared in a deck of clouds associated with a cloud front sweeping through the Cape Canaveral Air Force Station region at the time. 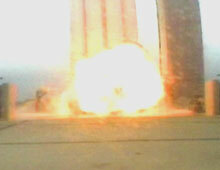 The nine solid-fuel boosters strapped to the base of the rocket all fired and dropped away as planned over the course of the first two minutes of flight. By five minutes after liftoff, the first stage main engine had shut down and the spent stage separate from the rest of the vehicle to fall into the Atlantic Ocean along with the nose cone covering the satellite cargo. A pair of firings by the second stage had propelled the vehicle over the Central Atlantic when the third stage and attached GPS satellite were spun up like a top and cast free. The third stage then ignited to provide the final push to place the payload into a highly elliptical orbit. Spacecraft separation occurred just over 25 minutes after launch. The kick motor attached to the bottom of the satellite will later fire to send the craft into its operational orbit 10,900 miles above the Earth where it will join the GPS constellation. Today there are 27 GPS satellites working to provide precision location and timing information to U.S. military troops and civilians around the world. 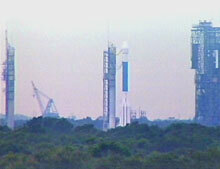 The new GPS 2R-6 craft, also known by the Air Force as Space Vehicle No. 41, will become the 28th and bolster redundancy for the network when it enters service in about a month. GPS 2R-6 will not necessarily replace an existing GPS satellite in the constellation, rather it will take over one of the primary positions in the fleet while an older craft in that slot moves to a backup role. The GPS network encompasses 24 primary satellites divided into six orbital planes with four spacecraft in each. The Air Force likes to have an additional four satellites in space as backups for an insurance policy. The new satellite will assume the Slot 1 position in Plane F. The craft currently in that position -- GPS 2A-17 -- will be moved to the backup slot F5 for the rest of its useful life, which has already exceeded expectations like so many of the GPS satellites. U.S. military troops, aircraft, submarines and ships around the globe are guided by GPS everyday. Troops also relied on the system extensively in the featureless desert battlefield of the Gulf War. Weapons can use GPS data for guidance as well. GPS also found its way into the civilian commercial market -- assisting planes, automobiles, boats, hikers and map makers. 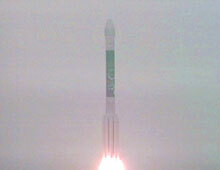 This was the 34th GPS satellite launched by Delta 2 rockets since 1989. 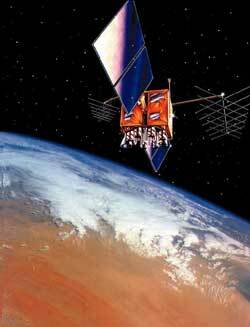 Five previous satellites have failed in space and one was destroyed in a 1997 launch failure. Fifteen more satellites in this current Block 2R series are due to be launched through 2005 by Delta 2 boosters, keeping the constellation replenished as older satellites breakdown and are retired. For Boeing, attention now shifts to the other side of the United States where the next Delta 2 rocket is awaiting launch in a week's time. The rocket is due to launch on Saturday, November 18, carrying NASA's Earth Observing 1 technology demonstration satellite, the SAC-C science probe for Argentina and a small secondary payload called Munin. The next GPS launch is scheduled for January 30. At least two more replacement satellites are slated follow in the second half of 2001. The Boeing Delta 2 rocket lifts off from pad 17A carrying the GPS 2R-6 satellite for the U.S. Air Force.